Houlgate is a popular seaside town on the Normandy coast (here referred to as the Cote Fleurie) to the west of Deauville and across the Dives estuary from nearby Dives-sur-Mer. 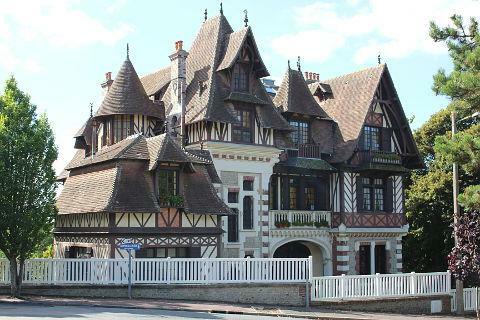 Originally a quiet agricultural village, the 19th century brought great change to Beuzeval, as it was then known, first with the construction of the Grand Hotel and many other luxury villas and hotels, then later with the arrival of a direct train line from Paris. By the start of the 20th century Houlgate had become one of the most popular resorts along this part of the English channel. 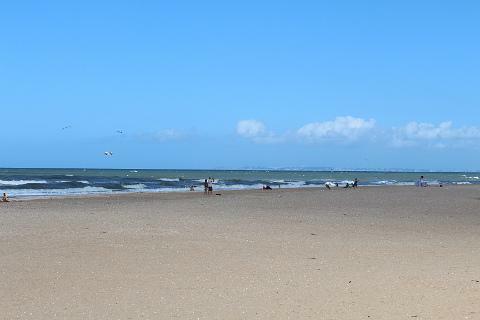 The beach at Houlgate is of course the principal reason that visitors come to Houlgate - it is long, sandy and very popular, with lots of different water and beach activities available. Although the two parts of the beach are continuous with each other there are two separate parts to the beach with the Plage du Temple to the west and the Plage du Casino to the east. The Plage du Casino is more centrally placed in the town, and the scenic path to the Falaises des Vaches Noires leaves from the eastern end of this beach while the Plage du Temple is quieter and has less facilities but parking nearby is generally easier. 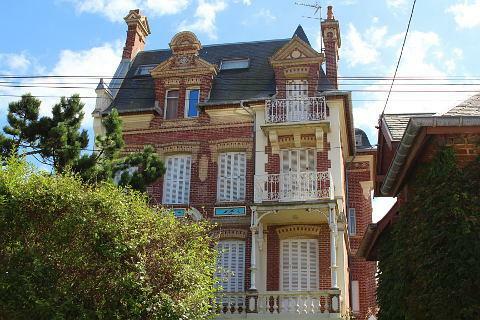 There is more to Houlgate than just beach however, so while you are here be sure to spend some time exploring the historical heritage of the town. 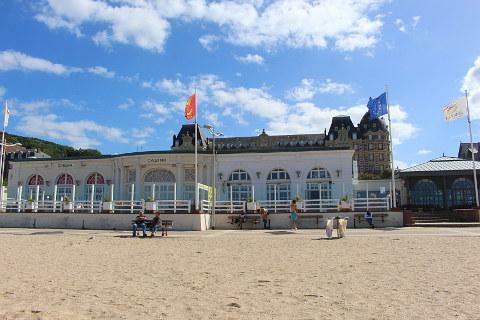 Behind the central part of the beach the first building you will notice is the Grand Hotel. 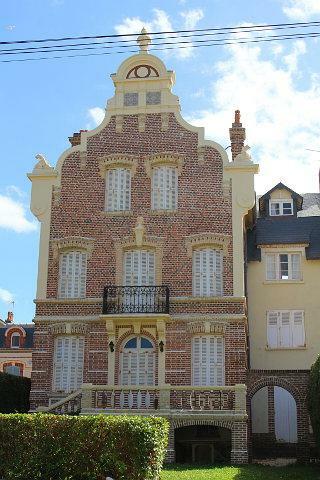 Built in 1859 and central to originally promoting the village to visitors, the development of modern Houlgate is closely tied to the history of the Grand Hotel. An imposing building in brick and stone, the hotel was expanded in the 1890's, and the large domed tower at the right hand end was added 10 years later. Historical note: during the First World War the Grand Hotel and several other important buildings nearby were requisitioned for use as an army hospital. 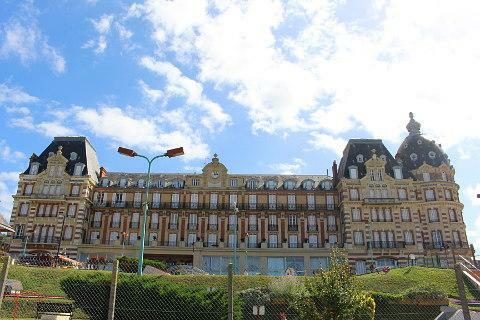 Around the same time the Town Hall was also built in Houlgate, and many smaller hotels, along with a casino, always a familiar site in resorts on the Normandy coast. 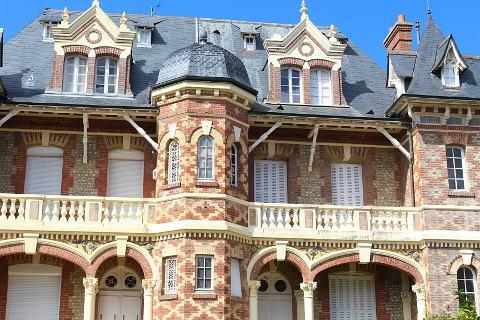 It was also at this time (around 1870-1900) that the many fine villas in Houlgate were built (300 of them), and it is these that give the resort it's charm and character. The styles ranges from gothic to new-norman and the variety is wonderful. The tourist office have a good map of the town which highlights some of the finest villas including the Villa le Castel, a beautiful new-norman style villa with pointy roofs and lots of decorative brick and woodwork. 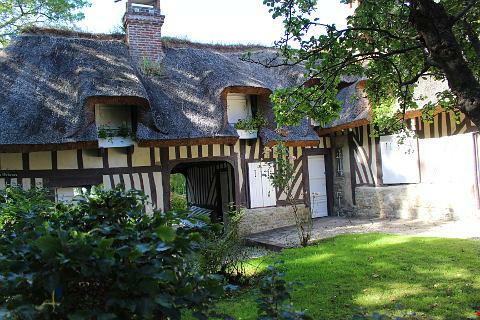 There are also some older medieval buildings such as the Maison des Pecheurs and the lovely Moulin Landry. These two buildings are down a quiet lane behind the railway line and a little apart from the rest of town. Be sure to take the trouble of finding them as they really are charming. 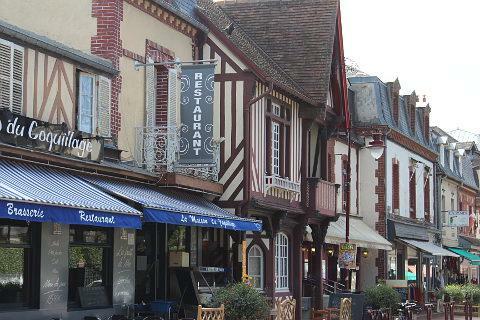 Be sure to also visit the covered market in Houlgate to buy your fresh produce, speciality locally caught fish. 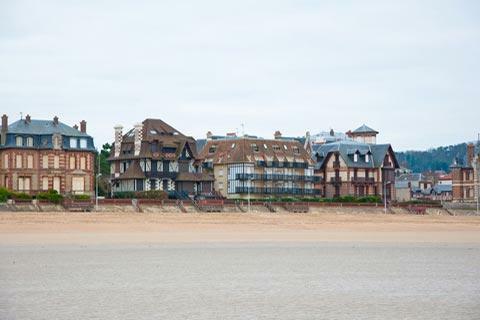 In and around Houlgate you can also find many other tourist and leisure related activities such as a golf course, tennis courts, the casino and a pleasure port. A scenic highlight to the east of Houlgate is the coastal section called the 'Falaises des Vaches Noires', where low cliffs and scrub descend to the sea, and fossil hunters scour among the rocks below the jurassic period cliffs. 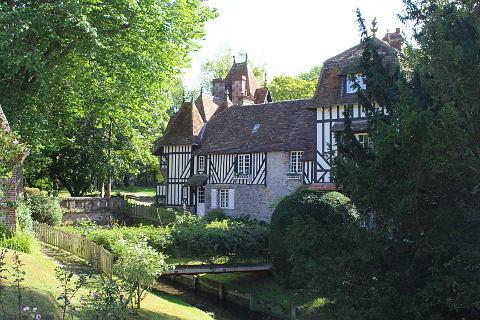 The Manoir de Beuzeval is an impressive red-brick manor house a few kilometres inland. 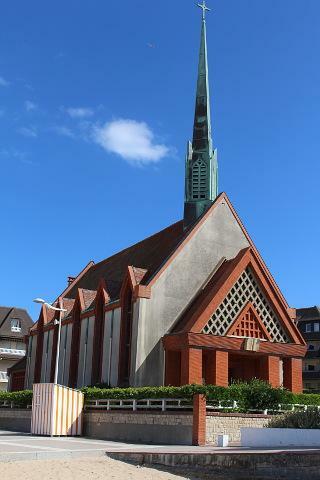 Other resorts you will like to visit nearby include Cabourg, just a short distance to the west of Houlgate, and Deauville, one of our favourite French seaside resorts and about 15 kilometres to the north-east. At the neighbouring town of Dives-sur-Mer you can see the port from where William the Conqueror set off to conquer England in 1066.